Car crime -Your car is an object of desire. That goes without saying – why else would you have bought it? But the problem is it’s not just an object of desire for you. Whether it’s the car itself or the valuables within it, your car is as much a target for thieves as it ever was. 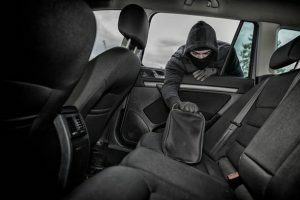 According to the Office for National Statistics, there were almost 358,000 reported instances of thefts from or of a motor vehicle in 2014 alone, with at least 30,000 going uninvestigated. Since then, the number of cars being stolen has risen by 30 per cent. And with car thieves finding new ways to make car crime work for them, such as the “pinch and park” trend, it isn’t a problem that’s going away any time soon. Well, no. It’s true that modern security systems are great deterrents. 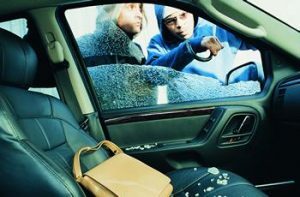 But a new survey shows that thieves are continuing to target prestige vehicles, such as the Range Rover Sport, and there’s much more you can do to keep your car safe than just pressing the button on your car’s remote and walking away. You can hear the central locking activating in most modern cars. The sound it makes is normally a heavy-sounding clunk or click. So stay close and listen as you press the remote button to lock your car, and make sure you hear the central locking activate. Many modern cars also feature a visual signal, in the form of flashing indicators. If yours is set up like this, make sure those indicators do indeed flash too. If you don’t get either of these aural or visual signals , it could be a sign that the fob isn’t working properly. That might mean your locking isn’t activating when it should, leaving your car unlocked and unprotected; if you have an alarm fitted, the likelihood is this won’t be activated either. But the cause could be something more sinister. Security experts believe that some thieves use remote locking jammers to target cars – preventing the signal from your fob from reaching the car, and ensuring it stays unlocked so that they can steal whatever’s inside. If you’re in any doubt whatsoever, it doesn’t hurt to double check the car’s locked. A good way to do this is to pull the door handle before you walk away. However, if yours is a car that features a keyless entry system, which unlocks the car for you automatically when you pull the door handle, this might simply re-open the car. In this case, the best way to verify that the car is locked is to look through the windows to check the internal locking mechanism. This can take the form of pins on the top of the internal door panels which drop down when the car is locked, or catches on the internal handle which flip inwards toward the door. On some cars, the handles themselves move inwards when it’s in the locked position. So if you’ve got a keyless entry system fitted to your car, get to know how your internal catches work, and check them through the windows before walking away. But checking your central locking is working correctly isn’t the only thing you can do to help stop thieves from stealing your valuables, or indeed, the car itself. Here are a few more top tips worth thinking about. You’re obviously going to feel nervous about leaving your car in a dodgy-looking area, but car crime can be a problem in the nicest parts of town. Wherever you park your car, do your best to find somewhere that’s well lit. If you have the option to park under a street lamp, do so, even during the day – if your car’s left there longer than you’re expecting, it’ll be lit when darkness falls. If you’re parking on your driveway or in a car park, make sure you park as close as possible to your home or another occupied building. And if you’re in a restaurant or pub, try and park where there’s a view of your car from inside. Even if you’re not able to get a seat by a window, someone else might notice something untoward going on. At the shops, meanwhile, try to park close to the main entrance and in amongst other cars – thieves are more likely to strike a car that’s on its own at the end of a car park than one that’s mixed in with all the rest, where other shoppers are regularly walking past. Sounds like an obvious one, doesn’t it? But you’d be amazed how many people don’t bother. Satnav systems are the most obvious trinkets that get left on display, but mobile phones, wallets and cash are also theft magnets. You should take these items with you if you can, but if you can’t, make sure they’re stashed well out of sight of prying eyes. Use your car’s glovebox or boot, or if it’s fitted with one, the lidded storage compartment in the central console. Don’t just think in terms of valuables, either. 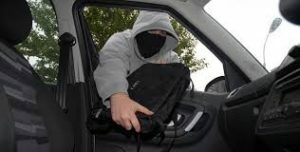 Bags, coats, and even jumpers are all attractive to a thief, even if they aren’t worth much, because of the possibility that they might conceal something that is, so don’t leave them in view on the seats. Also be aware of leaving important paperwork on view, so that it isn’t targeted for the purposes of identity theft. If you drive a modern car, the chances are it comes with an alarm and an immobiliser. But there are plenty of other ways to protect your pride and joy. Steering wheel locks, which fit over your steering wheel and hold them in place so that a thief can’t steer properly, aren’t infallible, but they do provide a deterrent for opportunistic thieves. Locks that do the same job for your gearstick or your pedals are also available. Or if you’ve got a little more money to spend, why not consider a tracking device? You’ll pay upfront for the device to be installed and then pay a small annual subscription fee, but if your car is stolen, the police will be able to locate it. You might also want to consider upgrading the security for your drive or parking space. Buying a small home CCTV system needn’t cost the earth, and it could help catch anyone who does try to steal your car. Or if you’d rather have something cheaper, a motion-activated home security lamp that shines down on your driveway could help put thieves off. Modern cars are full of clever security features, but you might not use – or even be aware of – all of them. For instance, did you know that many modern cars have systems which enable them to lock automatically as you pull away? Enabling these systems will help protect you against car-jackings – surely one of the scariest possible ways of having your car stolen. What’s more, some modern cars have lights that will stay on for a set time – usually 30 seconds – after you’ve left them. These systems are great for getting you to your door safely and ensuring someone isn’t lurking in the shadows. Check your user manual to see whether you have such a system fitted to your car and to find out how to activate it. Car security systems have advanced so far now that the easiest way for a thief to steal the car is often to steal the keys themselves. This can mean picking them from your pocket, or even stealing them from your house. So think about which pocket you’re keeping your keys in when you’re out and about. And when you’re at home, make sure you don’t leave your keys near to an open window, or even within reach of the letterbox. Some nefarious criminals have taken to ‘fishing’ through the letterbox for keys using a hooked length of wire. But don’t take your keys upstairs to bed with you. We’ve heard of an increasing number of cases in which criminals have broken in and threatened car owners when they haven’t found the keys they wanted downstairs. Better, we think, to have the car stolen than to have your family put at risk by robbers. Have you ever come out to your car to find its number plates missing? It’s more than just a minor inconvenience if it does happen to you – you should report it to the police immediately. Some criminals are stealing car number plates and then fitting them to their own similar-looking cars to perform crimes, such as filling up with fuel at a petrol station and driving off without paying. They know the police will check CCTV footage and come and talk to you about a crime you had nothing to do with. So if you spot your number plates are missing, it’s essential that you report it. It might seem like you’ll be away from the car for such a short time that it’s not worth turning the engine off – perhaps you’re just popping into a shop, or are dashing into the house to pick up something you left behind. But an opportunist thief only needs a couple of seconds to have your pride and joy away. The same goes if you’re de-icing your car on a cold winter morning – some thieves won’t think twice about running you down as they jump into the driver’s seat and speed off. And if your car’s stolen while it’s been left running like this, your insurance will be invalidated – so not only will you go through the hassle and stress of losing your car, but you won’t get any payout. …and your car is stolen, get a friend or a relative to drive you around the local area. Check down side streets, in public car parks and look for areas where thieves might like to hide a car. The recent “pinch and park” trend means that thieves nowadays are resorting to stealing a car by burgling the keys, and then parking it up somewhere else for a short period. The reason they do this is to check the car hasn’t got a tracking device. If it’s still there after a couple of weeks, the chances are it hasn’t – so the thieves can safely return to collect the car without the risk of a tracking device leading the police straight to them. So if your car is stolen, it makes sense to check the local area as thoroughly as you can. You never know – you might just find it parked up in a side road.